u‑blox has introduced a cost-optimized 2G cellular module for machine-to-machine (M2M) applications, such as utility metering and tracking systems. 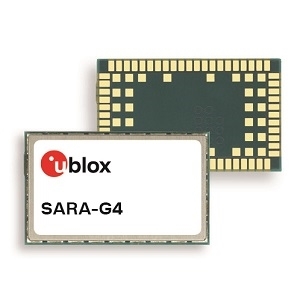 The SARA-G450 is a quad-band GSM/GPRS module lets product developers easily migrate their products to 3G, LTE, or LPWA technology to meet a broad range of environmental and technological requirements. 2G cellular technology offers reliable performance for mobile applications and broad geographical coverage. Until recently, this made it the technology of choice for machine type connectivity such as fleet management, metering and tracking. While some regions are currently phasing out their 2G network infrastructure (most notably the USA), 2G continues to be a viable and popular option for M2M solutions in regions still lacking NB-IoT and LTE Cat M1 networks or where coverage is spotty. The SARA-G450 is an ideal solution for cost and space-sensitive applications in these markets. Thanks to its pin-compatibility with the entire u-blox cellular line-up product designers can use a single platform and PCB design to enable solutions for a variety of air interface technologies, including 2G, 3G, LPWA (LTE Cat M1 and NB1), and high speed LTE. This also means that product developers can anticipate future upgrades of their applications to move to LTE Cat M1 and NB1 connectivity as soon as they become available in their target markets. The SARA-G450 is a standard grade quad-band GSM/GPRS module that is power-optimized for IoT applications. It offers the flexibility to combine with a variety of best-in-class u‑blox GNSS or Bluetooth modules for solutions that integrate positioning, short range and cellular communication. An embedded internet suite facilitates the development of a wide range of M2M devices. 2G technology continues to play a vital role in a broad range of geographical and industrial markets and will continue to do so for years to come. The SARA-G450 is a cost-effective module that addresses the demands of these markets while offering a clear upgrade path to LPWA technologies once they roll out. Samples will be available at the end of August with production starting end of September.